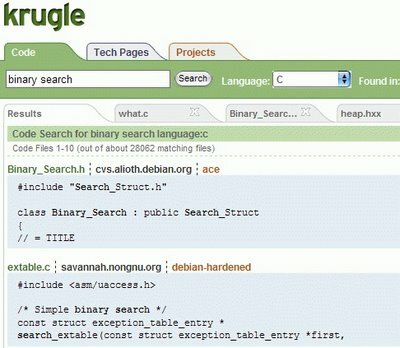 Krugle is a search engine for code. You can find code in C++, Java, Perl, Python, SQL, Ruby, XML and more, view it syntax highlighted, locate the library in the structure of the program, save it and share it with others. Krugle is useful for those who learn a programming language and need some help with basic functions or instructions, but it's also a good resource for advanced programmers that can find information on APIs, libraries, sample code and documentation. The interface uses tabs, so you can have more than one open file. The license of the code and its origin is clearly labeled. My only complaint is the relevancy of the search which is not very good: I had a hard time finding some C code for binary search using Krugle. Also the name is too similar to Google.